Even as minor leaguers, the so-called Moneyball Kids knew they were different. 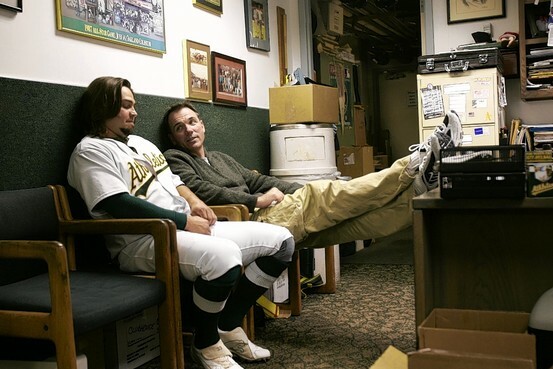 Getty Images – Oakland general manager Billy Beane talks to Nick Swisher in the clubhouse in 2007. “Everybody else was signing baseballs, and we were signing books,” recalls Nick Swisher, the first member of the Oakland A’s 2002 draft class, which is featured in “Moneyball,” Michael Lewis’s best seller. What the fans pressing those books into the players’ hands probably didn’t realize was that the book’s author may have been right nearby, watching and taking notes. The relationship between author and subjects sometimes runs deep, and continues for a lifetime; other times, it evaporates as soon as the book is published. In the case of Lewis and the Moneyball draftees of 2002, the publication of the book was only the beginning. Lewis felt a connection with the college-age draftees of “Moneyball,” who are secondary characters in the book, though nonexistent in the movie that opened this weekend. The Moneyball draftees are shown in the book as examples of Oakland GM Billy Beane’s new approach: drafting odd-duck players with then-underappreciated talents whom traditional scouts contended would not make the majors. Lewis realized he wanted to tell their story, as well, not as a sequel to “Moneyball,” per se, but a companion volume. So while his book was turning baseball upside down, Lewis was running around the minor leagues following Swisher, Joe Blanton, Mark Teahen, John Baker, et al, as they took buses through Texas cities like Midland, Frisco and Corpus Cristi. Now most of the draftees in the book have retired, while a few—Swisher and Blanton in particular—have carved out solid major league careers. Lewis feels the time may finally be right to tell their story, and could start on his new book next month. Lewis still talks with many of draftees once or twice a year. Swisher had dinner at his house. Teahen invited Lewis to his wedding. The Moneyballers came to trust Lewis, pulling down the wall that exists between baseball players and the reporters who cover them daily. One day, Lewis donned a Double-A Midland uniform, shagged flies in the outfield, and watched the game from the dugout—in uniform. Lewis excitedly told them about his next project—it would become “The Blind Side.” The players became friendly with Lewis and his wife, former MTV News anchor Tabitha Soren. “He was around a lot,” said Baker, now a catcher with the Florida Marlins. “We spent a lot of time with Tabitha as well, which was fun for us because we all remember her from MTV. Some of the Moneyballers have actually read the book, while others (ahem, Swisher) still have not, but all say they’ll see the movie, even though their characters aren’t in it. “I didn’t read the book—I always said I’ll wait for the movie, and I guess that worked out,” Blanton laughed. Even as they came to trust Lewis, they became more wary about others in the media. As the test-tube babies of the OBP movement, the Moneyball Kids were forced to grow up fast. Unlike the thousands of other 20-somethings in the low minors, the baseball establishment cared about their success or failure, as Teahen, now with the Toronto Blue Jays, recalled.